While the word passionate can feel overused to the point of cliché, in Ashley Bruns ’19 case, the adjective fits. The animal science major from Berlin, New Hampshire is nothing if not passionate about her achievements, veterinary medicine and public health, her parents who have supported and loved her, and the UNH faculty who have educated and guided her. And let’s not forget the New England Patriots: The diehard fan loves the team so much that she got a tattoo commemorating their 2014 Super Bowl win. Ashley Bruns: I am extremely proud of my development as a student at UNH. When I first began school, I had a difficult time wrapping my head around good studying strategies. It really does take a lot of hard work to succeed. Through hard work and perseverance, I earned better grades. I am proud to say I have made the Dean’s List every semester since spring 2017. I have also tutored students in organic chemistry, and I have a part-time job. Anything is possible if you set your mind to it. Bruns: I am motivated by my family and my professors. I have always wanted to find a way to repay my parents for everything they have done and continue to do for me. They truly deserve a huge amount of love and recognition because they made me the person I am. My professors motivate me to succeed academically, as well as guide me on my future path. The staff at UNH is so supportive, and I cannot thank them enough. "I love UNH because it can be as big or small as you make it. There are many opportunities to get out and experience quite a lot, or you can still enjoy many worthwhile experiences in smaller groups. The professors are always very available for help or even just to chat. UNH is truly a special place." 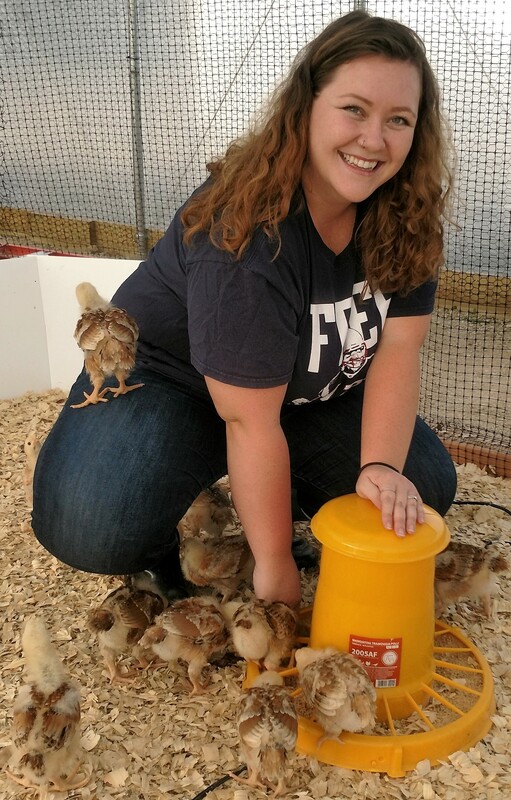 Bruns: I chose to be an animal science major because I always dreamed of being a veterinarian. Thanks to this wonderful program, I have gained knowledge and discovered what I am truly passionate about. The program is diverse and rich with kind and intelligent professors that have vast amounts of interesting experience. There are so many fascinating classes address the many facets of veterinary studies. Bruns: I know everyone tells students they need to study hard to succeed, but it is absolutely true. Set goals for yourself, and when you achieve them, set more. Keep an open mind. I strongly believed I wanted to be a small animal veterinarian, but my interests have changed as I learned so much more about the field. You have to discover what you are truly passionate about. Passion is what drives us in life, so finding a program you enjoy is crucial. Studying and learning are so much easier when you truly enjoy the material. It is a rewarding program, but you have to be self-motivated to succeed. It is also important to recognize every class, even those not in your major, help shape you to become a well-rounded individual. Bruns: After graduation, I plan on attending veterinary school to earn my doctorate in veterinary medicine as well as a master’s degree in public health. My dream is to be a state veterinarian and protect the public from many different diseases. I would also love to make more people aware of all the different dimensions in veterinary medicine. There are so many interesting and rewarding careers besides clinical practice. Bruns: My academic advisor guided me with which classes I was required to take to be qualified for veterinary school. One of my amazing professors also helped guide me in the right direction as far as applying to veterinary school goes. It is an extremely intimidating process, but having professors with knowledge and experience helps relieve a lot of the stress. My true goal in life is to find a career that makes me happy. I always say that if you are truly passionate about what you are doing, you will not have to work a day in your life. Educating people about diseases is what I love, and UNH offers many classes that fulfill the desire and pave the way to my future program. COLSA: What do you most love about UNH? Bruns: Being from a small area in northern New Hampshire, I was extremely worried about going to a bigger school. I love UNH because it can be as big or small as you make it. There are many opportunities to get out and experience quite a lot, or you can still enjoy many worthwhile experiences in smaller groups. The professors are always very available for help or even just to chat. UNH is truly a special place.